-- None -- 18" 24" 36"
Hose Bones is a new patent pending technology that allows users to custom form a radiator hose in 60 seconds to look just like an original custom molded hose. This is great for custom builds and saves time trying to cut existing hoses to find just the right bend. 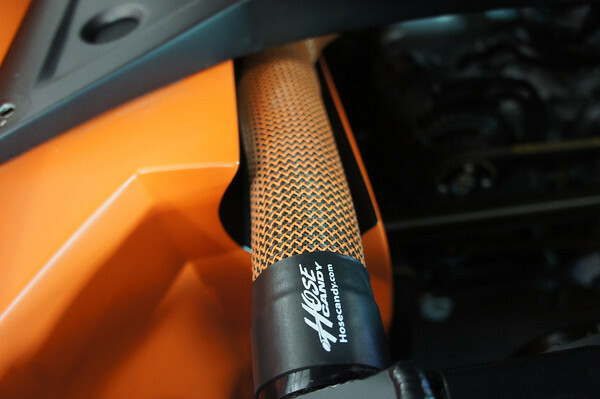 The Hose Bones Radiator Hose Kits come with your choice of Hose Skins. Hose Bones Radiator Hose Kits also come with a special stainless steel internal skeletal structure that can hand form 90° bends, curves and any custom shape. Hose Bones Big Block Radiator Hose Kit comes in three different lengths. Heat Shrinkable BOA Clamps (4) 2.25 - 2.5"
Hose Candy Skin Kits provide the ultimate in custom styling and enhanced performance. This Kit includes Boa Clamps Hose Skins for your vehicle. For the right fit, there is no “one size fits all”. This is a new patent pending technology that allows users to custom form a hose in 60 seconds to look just like an original custom molded hose. This is great for custom builds and saves time trying to cut existing hoses to find just the right bend. Hose Bones can also come with your choice of Hose Skins. Hose bones comes with a special stainless steel interior skeletal structure that will retain its shape when bent and formed. Hose bones can hand form 90° bends, curves and any custom shape and will retain that custom shape. Another great feature is if you didn't make the correct bend… no worries, it is easily re-formable. Another amazing feature is that those candy allows for multi-axis complex bends. This gives the user unlimited ways to custom form the hose. If the hose has to bend up, then sideways, next bend down then turn the other direction and finally go back the direction it came from … it's all possible . Hose bones will also prevent kinking of the hose as it will have a minimum bend radius. Hose candy sells hose bones in a variety of hose materials. Since the skeletal structure is stainless steel it is compatible with virtually all automotive fluids. For vacuum and turbo hoses hose bones utilizes a silicone hose jacket that has excellent performance in high-temperature applications and is available in a variety of sizes and colors. hose bones has the appearance of standard silicone hose that is custom shaped and molded. This provides a very expensive and custom formed look that has never before been possible for the do-it-yourselfer. Not only is hose bones custom formable, but like the bones in your body it provides incredible strength. Even in the most extreme vacuum conditions hose bones will not collapse or leak. hose bones will also prevent expansion of the hose in higher pressure applications thereby helping the hose stay attached to the hose barbs while preventing leaks. Imagine never having to worry about your brake booster hose collapsing or leaking during high vacuum or braking conditions. The hose bones's metal liner significantly improves the overall strength of the hose and will help to prevent damage and leaks … all at the same time allowing for custom formed hose. The hose and bones skeletal structure is made of stainless steel and can be used to produce many different hose products. Hose bones comes in silicone hose, fuel line, heater hose, evaporative emissions hose, and many other types of hoses. Hose bones is patent pending because of its revolutionary design and application.